I want to highlight the biggest number in Green and the smallest number in Red. No matter what I seem to do the MAX formula conditional format never works. The smallest value gets highlighted in red, but I never see anything in Green. Do I need to do something different when using two conditional formats in the same column? This seems like it should be a simple process but I have really been struggling. Any help would be greatly appreciated. I'm also attaching the first row of my spreadsheet so someone can see what I'm trying to do. Working on an XLSX file with LO is a dubious idea. 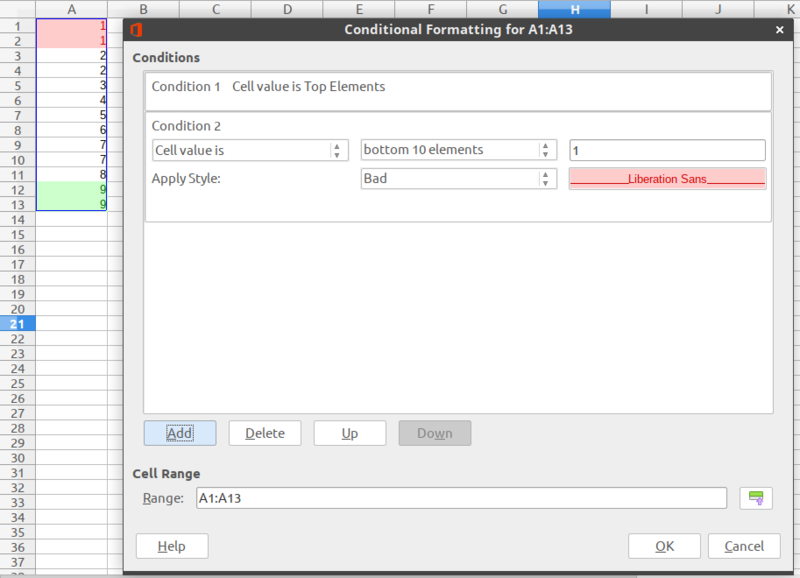 Nevertheless you should use absolute addresses for your Conditional Formatting. So if you want, that the range keeps the same for all comparisons, then you need absolute addressing in the range. Try is with Cell value is equal to MAX(D$5:D$35). But the question remains, why there is not any green. With the formula MAX(D5:D35) there should be green in 825.71 , 785.82 , 758.09 , 720.34 , 710.85 and 483.00. I don't know the reason. If you copy the range and paste it to a different place in the sheet, you get the green items. A hard recalculate does not force the green items in the original range D5:D24. Edit: I found the reason. Below the orange range, there is the total in D36. So because of the shifting from D6 downwards, the range, which is used for comparison always contains the total. Therefore no cell of the orange range can be the maximum. This is a better alternative to say "min/max value in the given range" instead of hardcoding the range in the formula. Once I add the formatting to my range, I get my green(high) and red(low) but it also marks all empty/blank cells red, which makes sense since they are all a small value. Is there a way I can make it ignore blank cells until I input a value into it? Once I get this working, will it be simple to copy the formatting to other columns?